Ft. Myers Beach Watersports Fun for the Whole Family! 3 Great Locations. Click here to find one now! Welcome To Holiday Water Sports Fort Myers Beach! Holiday Water Sports is Estero Island's premier water sports attraction for Dolphin Adventure Tours, WaveRunner Rentals, Beach Chair & Umbrella Rentals, Sailboat Rentals, Parasailing, Kayak and Stand Up Paddle Board Rentals. We have been in operation since 1991, and offer year-round water sports at competitive prices. Get off the Snow Board and try a Paddle Board instead! Paddle Boarding is offered at all locations and is easy to learn and fun for the entire family. Let our experienced and knowledgeable staff teach you the basics for a variety of family-friendly water sports activities. We take pride in having the most up-to-date equipment for our guest's safety and enjoyment. 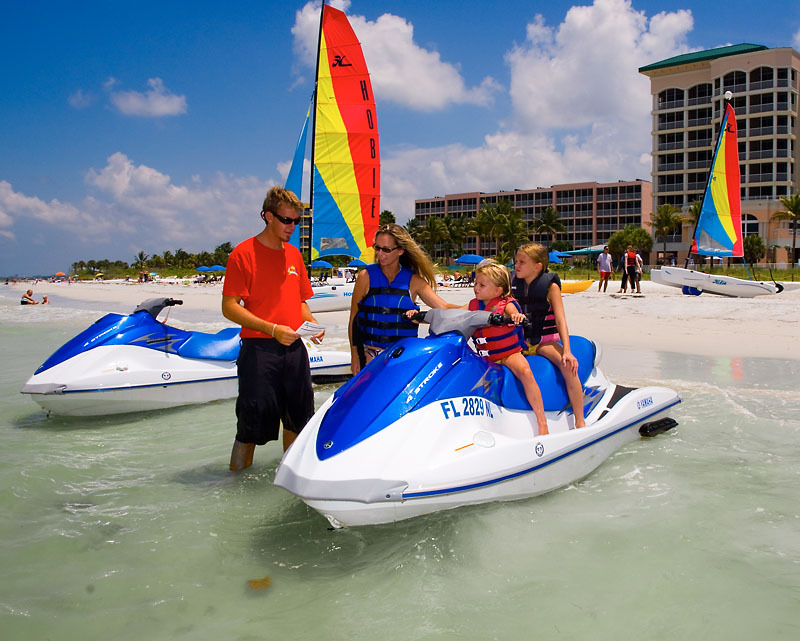 With three locations on Fort Myers Beach, you never have to drive far to enjoy a day with Holiday Water Sports. Ask about our Eco-Tours and private cruises. For groups of 10 or more, let us customize a package for you. Our beach services include half day and full day rentals of our blue canvas umbrellas, with 2 comfortable lounge chairs. We also lease cabanas to provide you with sun protection. If you lease these for 3 days or more, we’ll provide a discount. Guests of the Pink Shell Beach Resort have the opportunity to try our Stand Up Paddle Boards and Ocean Kayaks free of charge! We are close to Sanibel Island and Cape Coral. Remember to leave early and beat the traffic! Feel the splash of salt water and the wind in your hair as you race over the calm Gulf of Mexico waters surrounding Fort Myers Beach. We have the largest WaveRunner free-riding areas on the island. A driver and up to two passengers can experience this exciting ride! Our WaveRunner rentals are required to be kept within line-of-sight boundaries at all times. This helps keep you and your children safe while riding. And it makes it easy to switch drivers or passengers around during your rental time. You will receive a written and verbal instruction on how to operate a Waverunner. Our qualified instructors make sure your know the ropes before your rental time begins. Life jackets are also provided for your safety. Drone footage of our Dolphin Adventure Tour on Waverunners by SW Florida TV. In this clip you can see our tour traveling through Big Carlos pass and around Lovers Key on Ft. Myers Beach, Florida. Parasailing over Ft. Myers Beach is the most exhilarating and peaceful experience you’ll have in your lifetime! Our parasailing operation is subcontracted out to an experienced independent contractor, Estero Island Parasail. Your journey will be supervised by a USCG licensed captain and crew. Our Ft. Myers Beach Kayaking or SUP rentals are supervised for your safety and allowed in the shallow waters just off shore. Children and adults alike can easily learn the basics of paddleboarding and kayaking in the calm waters of the Gulf of Mexico. A Life Jacket and paddle accompany the equipment for your safety. Enjoy a beautiful and awesome experience with us on Ft. Myers Beach today.